"Will you walk into my parlor? Clifford Orr hailed from Portland, Maine, and during his short time on this earth made a living by his pen, starting with writing and scoring musical comedies for his school's drama club, which portended his moderate success as an occasional lyricist – scoring a hit with "I May Be Wrong (But I Think Your Wonderful)," sung by Doris Day. He also worked for a Boston-based newspaper, managed a Wall Street bookshop and rounded out his career as a "Talk of the Town" columnist for The New Yorker magazine. A perfectly respectable and presentable résumé, but not entirely complete. It misses an important, if short, period from his career and that brief stint is of interest to the ferocious consumer of crime-fiction. 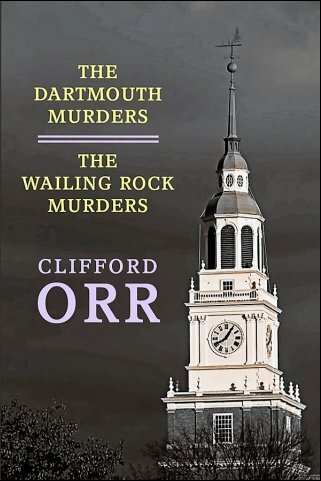 During the late 1920s and early '30s, Orr wrote and published two mystery novels, The Dartmouth Murders (1929) and The Wailing Rock Murders (1932), which have since fallen into obscurity. A third book was announced, called The Cornell Murders, but it was never published. So there we have another entry for this lamentable list of lost and unpublished detective stories. Fortunately, the other two have emerged from literary oblivion and found their way back into print. Earlier this year, Curt Evans, genre-historian and mystery enthusiast, announced that a small publishing house, Coachwhip, was reissuing The Dartmouth Murders and The Wailing Rock Murders as a twofer volume – for which he penned a short, but insightful, introductory piece. On a side note, Evans seems to have a finger in a number of pies these days and it's starting to resemble the formation of a syndicate, but I love it when scarce, long-forgotten mystery novels get reissued. So I'll just pretend I did not see any syndicate forming going on here. Anyway, let's start with this review: I decided to begin with Orr's second mystery novel, The Wailing Rock Murders, which Evans described as an "original work" possessing "a strong element of terror" reminiscent of the "eerily atmospheric Thirties detective novels" by the John Dickson Carr – such as The Three Coffins (1935) and The Crooked Hinge (1938). Surprisingly, the book is not a locked room mystery. I say surprising, because it is listed in Locked Room Murders (1991) and secured a spot in the line-up for the "99 Novels for a Locked Room Library," but there's not a trace of a genuine impossibility to be found between its pages. Only the dark, moody atmosphere makes the book comparable to the work of Hake Talbot, Joel Townsley Rogers and Carter Dickson. One of the first notable aspects of The Wailing Rock Murders is the detective-character, Spaton "Spider" Meech, who is a grotesque and deformed monstrosity: a twisted spine turned him into a hunchback and his long, gangling arms hang well below his knees, while his large head seems to lie on his chest when he walks – which earned him his nickname. He also prefers "to sit cross-legged on tables or on the floor" rather than rest his hump "against the unyielding back of a chair." This malformed image makes children laugh and old ladies cross themselves, but it has served him well when he started to make a name for himself as a Great Detective. After all, the press and public love stories with strange or unusual angles and characters. The Wailing Rock Murders finds Meech in Ogunquit Beach, Maine, where his ward, Garda Lawrence, is a guest at the home of the Farnols and she invited her Uncle Spaton to join her there. Creamer Farnols is an amiable, twinkle-eyed host and his wife, Vera, was described by Garda as "a peach," but suffers from occasional "intervals of unconsciousness." They've a daughter, Patricia, who has invited Philip Masterson: a silent, moody and introspective young man. Garda also invited a young man, Victor Millard, but he has a forthcoming and good-humoredly personality. Finally, there is a holidaying chemist, Richard St. John, and his wife, Helen. All of them are packed inside a "scabrously ugly" house, a complete monstrosity, perched on a cliff, like "some strange foreign growth," which has "a many-angled cupola topping the whole abomination" – making it appear as "the head of some underworld king" protruding "from the rocky earth." The house has a twin structure perched on the rocks of a nearby cliff. 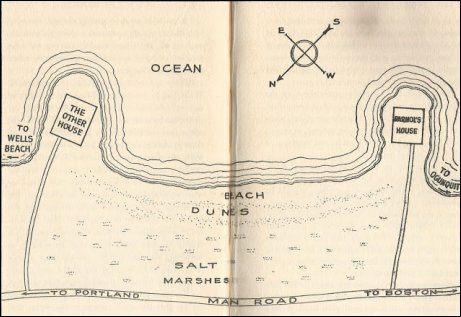 Below them are the windswept and haunted beaches, which is where the cursed rocks of the book-title can be found: there's a curiously-shaped cavern down there and "whenever the wind blows across the opening in a certain way" a slight humming can be heard, but, every now and then, a tremendously heavy wind produces a heart-wrenching wail. A wail that, according to the legend, foretells of death. I found this to be somewhat reminiscent of the cursed, rocky protrusions from Arthur J. Rees' The Moon Rock (1922). Well, the legend of the wailing rocks deliver on their promise and a gruesome murder occurs not longer after the arrival of Meech, which he discovers: Meech finds the body of his ward, "her throat most horribly, most hideously slit," inside the cupola room. So he immediately takes charge of the investigation and the local sheriff allows him to usurp all of the authority in the case. One of the criticisms often leveled against the Golden Age detective story is the freehand given to meddlesome amateurs and semi-official investigators, but Meech takes it to the next level – basically hijacking the office of sheriff. I do not recall having come across anything like this before. However, Meech does function as a proper investigator: drawing maps, compiling timetables and conducting interviews, but what really drives the narrative is stumbling from one situation into another. He angrily listens to the murderer's confession, which leads to a second throat-cutting in the cupola of the other house. A supposedly empty, deserted and boarded up place, but Meech discovers it houses an embarrassing family secret and leads him to a third murder – one that's buried deep into the past. It also becomes apparent that mental issues and twisted minds are a common feature among this small cast of characters. All of this takes place over the course of a single, sleep-deprived night and during the early morning following their nightmarish experience. And as the sun rises, Meech figures out the whole mess and comes to an unsettling conclusion. The explanation is surprisingly simplistic and you've got to admire the fine tight-rope Orr tried to traverse, but there's a problem or two: one of them is that the solution made nearly all of the plot-threads appear as irrelevant and only served as a distraction from the obvious. Secondly, the passing of time dulled the twist of the solution. It was not entirely new when the book was originally published, but Orr's application of it was unusual and noteworthy. I suspected such sort of game was being played, but kept being lured away from it by the other plot-threads. So, all in all, The Wailing Rock Murders is not one of the all-time greats from the genre's Golden Era, but still a good, fun and solid read. If you love such mystery writers as Carr and Talbot, you'll probably like this one. Regardless, I suspect The Dartmouth Murders will end up being my favorite of the two. It sounds like Patrick Quentin (college setting) meets Ellery Queen (father-and-son detective team). So you can expect a review of that one in the near future and I'll try to have a genuine locked room mystery for the next one. By the way, is it just me or is there something different about this place? Not sure what "this place" in your final sentence refers to...? I've recently read Coachwhip's reprint of Clifford Orr, and I enjoyed both novels. I wasn't sure how much of a fair-play novel I would consider 'Wailing Rocks Murders' to be, although I enjoyed its atmospheric writing. If I recall correctly, Curt seemed to like it better than 'Dartmouth Murders', but I enjoyed that one too - although it seemed to be even less well-clued. I think The Wailing Rock Murders can be considered fair play, because the plot was simple and the explanation for both murders were pretty much thrown into your lap. Where it becomes a bit iffy is that the book spends most of its time distracting your attention away from the obvious. So some would regard that as a bit of cheating, but an interesting approach to the detective story. As you said, the writing and atmosphere were enjoyable. This one sounds interesting. Thanks for the tip. The "something different" seems to be Sherlock Holmes. I think I like it the other way better. Maybe if you added a period illustration from "The Adventure of the Second Stain" there would be a better connection. Wait. So you can all see the new banner image, but not the new color scheme of the blog? You still see the blue one? I hate blogger. I like your suggestion about "The Second Stain," anon! I'll look into that. I can see the brown background also. I see the brown one and like it. Looks like a vintage touch. The new look is nice. The "syndicate" approves! By the way, there's more about Orr in a forthcoming collection of essays I edited, Murder in the Closet, in an essay on him and Rufus King. No news on The Cornell Murders, however! Incidentally, got a blog piece on an Upfield title coming soon! Glad to read the syndicate approves and looking forward to your piece on Upfield! By the way, on the book reprints, I recommend books to both Coachwhip and Dean Street Press and this year Doug Greene asked me to write the introduction to his collection of Patrick Quentin short stories. I think that's as far as it goes. These publishers get the sales revenue, I don't. Perhaps some day I may reissue some books myself, but I will be up front about it if I do so. I like the new look. It's uncomplicated and easy on the eye. Only the dark, moody atmosphere makes the book comparable to the work of Hake Talbot, Joel Townsley Rogers and Carter Dickson. I haven't read Hake Talbot although Rim of the Pit seems to be remarkably highly thought of. I guess I really should make an effort to track down a copy? It's one of those books people either love or hate, but if you like Carr, there's a good chance you'll love it. So, yes, I recommend tracking down a copy.